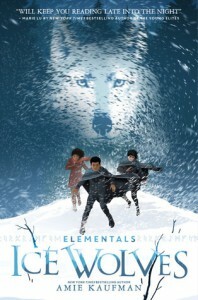 Ice Wolves is the story of 12-year-old orphaned homeless boy Anders who, upon finding he can transform into an ice wolf, is separated from his twin sister Rayna, who transforms into the ice wolves’ bitter enemy the scorch dragon. I didn’t know what to expect going in to this. I’ve never read an Amie Kaufman book before, and this is middle-grade as well when I normally read YA, but I was immediately drawn to the use of elemental magic combined with shapeshifting. I thought we would see the story from both the twins’ points of view, as you probably would in a YA novel, but this stuck with Anders as the single protagonist and it worked really well. Anders starts off as a shy beta twin, used to rambunctious, confident Rayna taking charge, but once she’s gone, kidnapped by dragons, he quickly plots to save her, and that involves enrolling at Ulfer Academy, the home/barracks of the ice wolves, and becoming part of their pack. This means that the plot, apart from Anders trying to figure out how to save Rayna, also consisted of boarding school-type tropes such as shared dorm rooms, combat and history classes, revered professors, and communal eating. I really enjoyed this aspect, and I loved seeing Anders growing as an individual as opposed to one half of a set of twins. He really came into his own, made his own choices and his own friends. One thing I would like to mention is the casual approach to gender and sexuality. Kaufman mentions that one highly regarded female professor was married to a woman, and one of Anders’ fellow first years is gender neutral, using the term ‘they’ instead of ‘he’ or ‘she’, which I’ve never come across in a novel not trying to make a point about gender identity. It was cool to see that dropped casually into not only a fantasy novel but one aimed at a middle-grade audience. Anders also makes a strong friendship with a female student, with no hinting of romance, and the first years share mixed-gender dorm rooms. I liked how Kaufman revealed the world lore, with the ice wolves and scorch dragons, and kids at the Academy travelling from all over the country to attend. There was even a character from the territory of the thunder lions who was a wolf instead, so I’m hoping to see more of the other elemental shapeshifters in future novels. I’m not sure what the future holds for this series but I am definitely invested and I hope to see lots more books in this world.